Jane Austen fans, rejoice! 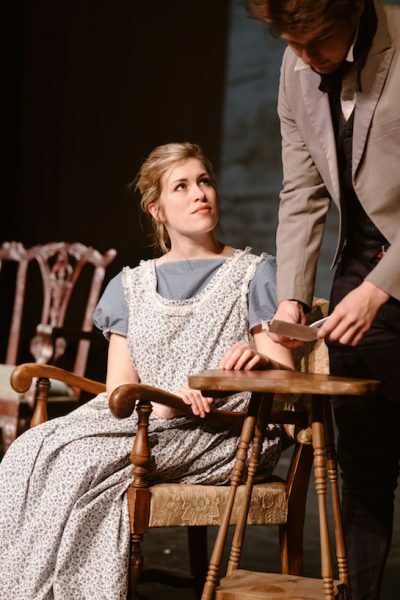 ISU Theatre is bringing Austen’s classic novel “Sense and Sensibility” to the stage this February. The quick-witted, romantic adaptation plans to imbue Austen’s beloved novel with a fresh female voice, emotional depth, lots of humor and bold theatricality when it opens Friday, February 22 at 7:30 p.m. at Fisher Theater in Ames. “Sense and Sensibility,” based on Austen’s 1811 novel, captures the story of the Dashwood sisters – sensible Elinor and hypersensitive Marianne – as they are plunged into financial and social uncertainty after the death of their father. The sisters must learn to weather the ridiculous societal pressures of the time to secure love and happiness. Penned by Iowa State University alumna Kerry Skram (‘95 English), this adaptation is a whimsical, relevant and contemporary take on the protocols of love, said Cason Murphy, assistant professor of theatre and the show’s director. Moments of whimsy will lighten the production’s formal social conventions, like when letters fall down upon a male lead after one of the sisters writes him love notes. 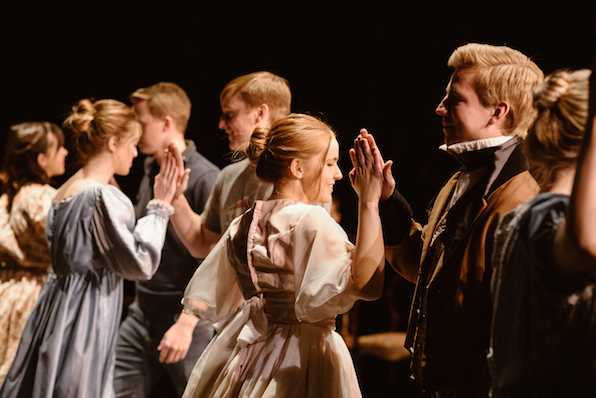 All characters will be on stage during the entire production, Murphy said, creating a diorama-like view of the social circles surrounding the Dashwood family. Iowa State University students Erica Walling and Calvin Clark rehearse a dance scene as Marianne Dashwood and Colonel Brandon. While instrumental versions of pop music will give the show modern soul, the production retains the period costumes, language and setting of Regency-era England. It also includes a dance scene that Skram wrote specifically for the ISU Theatre production. Abbigail Markus (‘22 statistics), the show’s assistant director, hopes audiences will enjoy this unique take on a classic novel. Die-hard Austen fans need not fear, however. “Jane Austen fans will walk away satisfied with an authentic adaptation while Austen newcomers will be inspired to read the original work and learn more,” Murphy said. 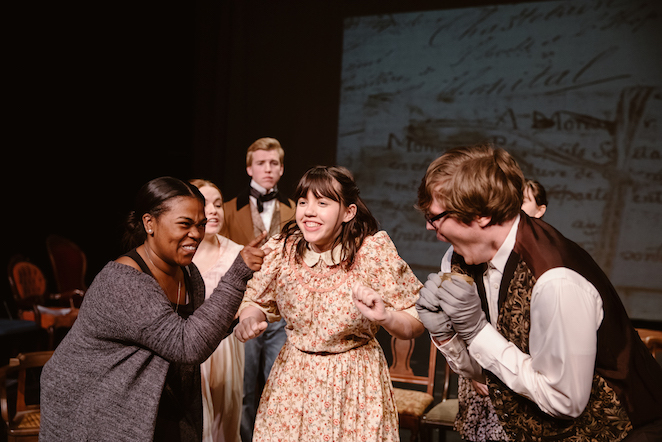 “Sense and Sensibility” opens on Friday, February 22 at 7:30 p.m. with additional evening performances on February 23, March 1 and March 2 at 7:30 p.m. Matinee performances will be held on February 24 and March 3 at 2:00 p.m. All performances are in Fisher Theater in Ames. Tickets are available through the Iowa State Center Ticket Office, all Ticketmaster locations or the Fisher Theater box office prior to performances. Tickets are $18 for adults, $16 for seniors, and $11 for students. For more information, visit www.theatre.iastate.edu, email isutheatre@iastate.edu or call 515-294-2624. ISU Theatre is funded by ISU Student Government and supported by the Transforming Liberal Arts and Sciences Endowment.